In the range of the albums which seem totally lacking of interest and which turn out to be real surprises, this “Green Isac Orchestra” from the Norwegian duet Green Isac must appears certainly at the top of list. Flanked of 3 invited musicians; Jo Wang on keyboards, Frode Larsen on the percussions and Tov Ramstad on cello, ukulele, saw and on bass, Morten Lund and Andreas Eriksen give thus more depth, more wealth and more horizons without borders to their tribal approaches always soaked by the Scandinavian poetry of Erik Wollo's influences. Moreover there is a delicious mixture between these influences of Robert Fripp, Markus Reuter and Erik Wollo on “Green Isac Orchestra” of which the main attractions remain nevertheless a solid play of the manual percussions and these ill-assorted sound elements which untie some atmospheres always near the unexpected. The seduction begins with these wavelets of chords which wave in suspension and which are congealed in a very Jerome Froese approach, The Speed of Snow for instance, of "Emmesity". The ethereal Electronica, fed by transitory sound elements of a very psychedelic kind (we would say a horse and its clogs which hesitates to walk), is transformed into a slightly lively tribal rhythm where Andreas Eriksen's clanic percussions drums a sharp but soft rhythm, and especially a very mesmerizing one. The electronic effects and the guitar, always very secret and intuitive, and its riffs in loops bear the harmonious portion while that Tov Ramstad adds a melancholic depth with the tears of his cello. The duel piano and electric guitars between Jo Wang and Morten Lund puts down the roots of this perception that Erik Wollo affixes his inspiring claw on the music of Green Isac and the bells, of which the ringings resound between two phases of rhythms and harmonies, stigmatize these soft neo-ambient folk perfumes of Sensitive Chaos. The bass does very Patrick O'Hearn! 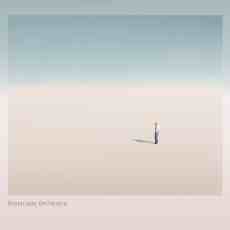 Lively and very harmonious, "Emmesity" sets the tone to a very good music 40 minutes which still has no borders. With dark breezes, chords of a guitar which streches its sadness in its effects of reverberations as well as its tears, the ambient introduction of "Thón" brings us to a very diversified sound level where all which was lying around in barns could serve as musical instruments. The rhythm is delicate and the very vampiric approaches of the guitar, as well as its effects of ambient reverberations, make of this track a kind of morphic and ghostly blues filled of the wanderings of Robert Fripp. The nervous percussions which open "Algebra" are stopped abruptly by a delicate piano which will cement its minimalist melody in all the changes of rhythmic direction of the track. From a tribal blues which melts into a lascivious ethereal dance, the piano forges its earworm which tends to forget the titanic work of the percussions on this track to which we hang to it as much as with "Emmesity". "Dr One" is not outdone. Its ambient introduction is forged in the mysticism of the nights of North Africa with rattlers and organic tones which seem to roam under the cold moon. Little by little these moods free themselves from the yoke of the cloudiness in order to offer another good clanic down-tempo with the cello, the guitar, the saw and the electronic effects, which sculpture long guttural sound lassoes, of which the meshing offers a beautiful envelope of ambiences and harmonies to the percussions which get more and more incisive. "Hapi" proposes a more ambient approach with its riffs of guitar which run in minimalist loops throughout its 386 seconds. The tears of guitar, of cello and of the saw weave a creative cloud of melancholy, while the percussions which fall at the edge of 5 minutes force a slow rhythm which is well supported by a snoring bass. That remains always ambient and near of Patrick O'Hearn ethereal moods, whereas that "Madar" dives into a tribal approach of the Middle East with good percussions, a keyboard which stigmatizes its minimalist melody between our two hemispheres as well as an ingenious duel between the guitar and its effects which fight with a very acute cello. "57 Varieties" ends this 6th album of Green Isac with a guitar and a violin which offer a harmonious duel weaved in jerky chords and bouncy riffs. The percussions, as well as its hidden treasures, and the bass structure a steady rhythm while effects of guitars and the escapades of the violin transform the approach of staccato into a more melodious shape. Even if we are always very far from Berlin School, the music of “Green Isac Orchestra” remains very refreshing. The electronic effects are very shaded by a guitar and this saw among which the effects and the plaintive harmonies can be confused easily with the tortuous synth layers or still in solos which get lost at night. Everything is story of perception here! Those who like neo-folk and tribal ambient are going to devour this album of the ears. A delicious album that I would place between Sensitive Chaos and Erik Wollo; two artists who possess this gift to bring out melodies eaters of eardrums through a beautiful sound decoration create in an unlimited imagination without borders. A little like last year with the duet of Polymorph and Namaste albums, TM Solver gets back titillating the ears of his fans with an album of pure New Berlin School, for Maroc, and another one of ambient music. Inspired by the northern and frosty landscapes of the Spitsbergen island, “Svalbard” is a music album of meditation, of contemplativity that Thomas Meier has written during his journey in the archipelago of Svalbard, Norway, in 1993. This music had never found echo on a recording before this day. Recorded and remastered in 2015, the SynGate label is offering it in a download format under its Luna banner. A brand which is dedicated a little more to the music of atmospheres than of rhythms, although both forms can coexist. A little as with this “Svalbard”. It's with pulsations which beat sneakily that "78°N19°E" gets developing between our ears. The rhythm is soft and beats lasciviously, as a kind of slow, sensual and cosmic Funky-Groove. The bass pulsations go up and down in an ambient pattern where elytrons of metal are flashing, relaxing stars are sparkling and astral choruses are warbling. The movement is slow and rather poetic with these crystalline tones which sparkle here and there. 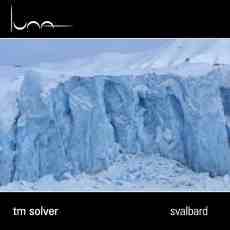 Torn between its envelope of atmospheres more cosmic than Arctic, although both poles are very near, "78°N19°E" scatters elements of ambient rhythm, here and eleswhere in “Svalbard”, which crackle and skip nervously, like steps lost on a tense drum skin, in the resounding curves of the bass pulsations and these lines of synth filled of voices and of astral mist. Our thoughts go adrift towards the very ambient "Snowfall" and its breezes full of prism which whistle in the ice-cold reflections of the synth lines fed of Arctic colors. These lines are overflowing in the ambient territories, and less threatening, of "Arctic Dream", a long track with profound meditative atmospheres which little by little reveals a structure of rhythm. A structure always so very lunar with soft beatings which sculpts a walking in a thick coat of snow where some uncertain steps accompany others more assured. The atmospheres are always signed by synth lines of filled with harmonies mourners and of scarlet colors, challenging even sometimes the nature of this album which is inspired by the Norwegian coldness. "Northern Lights" drives us a little in the psybient territories with a structure of slow rhythm where always crackle these crumbs of rhythm crushed on a bandaged skin in between lines of a synth haloed by vocal breezes and by icy mist. The bass line is feeding more and more a morphic down-tempo approach where is sparkling and crackling a thick clouds of chords paints in the colors of the Arctic prism. "Polar Night" is as ambient than "Snowfall" and is built upon the same icy elements while the title-track is a long wall of very meditative atmospheres. We are in the most ambient moods of “Svalbard” here. Doubtless the most livened up track of “Svalbard”, "The Little Auk" draws marvelously the walk very muddled of this funny little auk. Except that he is not alone and the lines, just as much incoherent, of rhythms weave a gyrating core where sequences prevail on the very discreet songs of the synths. The whole thing goes up to "Olav v Land" which concludes this album of Greenland atmospheres with a mixture of rhythm and non-rhythm where the sequences and the percussions have difficulty in dominating the synth lines which pile together in a thick wall of atmospheres always rather contrasting with the coldnesses imagined of this archipelago lost between the glaciers of the Atlantic and Pacific Oceans. 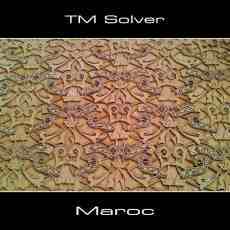 Songs from sands and nomadic breezes, the very lyrical approach of "Part I" doesn't show no doubt regarding the influences of this last album of TM Solver. From north to south of Morocco, and by following the landscapes sculptured in the azure of the tops of the Atlas mountains, “Maroc” is a series of sound clichés which are linked one to another in a long mosaic of sounds and tones of 72 minutes and which are inspired by the most beautiful moments of a journey of Thomas Meier in the country of Casablanca. Offered in a download format, “Maroc” is set by a beautiful artwork which is very representative of the panoramic atmospheres of this album which respects in every point those finely jerky minimalist rhythms, like ambient stroboscopic strands, of the TM Solver universe. If "Part I" is weaved in the ambient onirism, "Part II" brings us towards a level of rhythm just as much poetic with a series of sequenced keys of which the chains of jumps weave a circular structure which is nuanced by an upward approach. We are in the lands of New Berlin School! The table is on for a long minimalist structure to which will be added a pleiad of elements, as rhythmic as harmonic, and especially where Thomas Meier excels at the art to deepen his textures with tonal decorations which are as well charming as unexpected. Strata of melancholic violins, clouds of ethereal voices, sound graffiti as cosmic as ambiospheric, jingles of percussions and strands of sequences which fall to pieces in a long gyrating parade, "Part II" takes its heaviness, and a little more vigor, in a gradually evolutionary structure which flows between our ears as this old sound friend who knew so well how to magnetize our senses in those beautiful golden years of New Berlin School. This is a very good track with a very hypnotic minimalist rhythm whereas that "Part III" offers a rather vaporous structure with rotating ambiospherical loops which float in breezes of synth, some are nuanced by celestial voices, with evasive forms and harmonies. These moods float up to the doors of "Part IV" which does very Broekhuis, Keller & Schonwalder, and sometimes very contemporary Schulze, with a delicately tribal rhythm which welcomes a thick cloud of breezes and synth waves filled with solos, as dreamy than melodious. "Grand Taxi" distances itself straight out with a more lively and a more catchy rhythm. The bass pulsations, as well as the subtle tsitt-tsitt, release an ambience of morphic dance music, kind of cosmic Groove, where our head and our fingers move more than our legs and hips with beautiful electronic effects, one would say these futuristic cackles from the Robert Schroeder universe, and with some fragile glass arpeggios which sparkle in the shadows of long twisted solos. "Café de Paris" takes a little bit the same structure as in "Part IV" but with a slightly more bouncing rhythm. The sequences skip and bury the tribal beatings in their dark curves, while that glass tones chords are clinking in a clearly more loaded atmosphere where the synth lines and twisted solos abound in contrasting colors; amber and azure. Once again, TM Solver seduces. Even with a charmingly tribal approach which reminds me enormously the Repelen series from Broekhuis, Keller & Schonwalder, “Maroc” confines Thomas Meier in his comfort zone. There where he is so difficult to drive him out and where he always offers this music which accompanies us as the hand of a friend while we walk the spirit wandering. 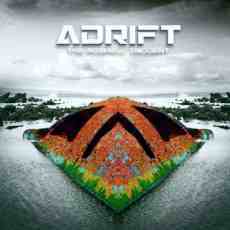 “Adrift” for gliding, for floating! Being adrift like the music of this last album of the brothers Koen and Jan Buytaert who is filled with these ambiospherical perfumes of ether from the Berlin School retro years. Beneath the stars, because the music of “Adrift” was performed live in the festivals of Cosmic Nights in 2015 and E-Live in 2014, or in our room the eyes fixed there where our ears carry us, this 4th opus of The Roswell Incident follows the rules of Escape with some long and very atmospheric introductions which are use as bases, except maybe for "In Search of the Ancient Dominion", to launch delicate movements of minimalist rhythms always tugged by opaque movements of cosmic turbulences. Hollow winds decorated of melodious prisms open the long ambiospherical phase of "Out of the System". The dialect of machines diffuses chirping which sparkle in slow orchestral movements imagined by false violins which murmur these words of comfort lost in the limbo. It's a little like being drifting in a cosmos filled by very vague tones of carillons which sparkle under the caresses of hot winds. The orchestral murmurs caress tenderly muffled impulses which move like waves below one thousand feet in the oceanic depths. These waves become the stooges of our solitude while that quietly "Out of the System" unveils its arrhythmic armor where a sneaky structures of rhythm emerge from the clamors of an invisible crowd on the edge of 10 minutes. Fluty synth pads harmonize their catatonic airs to sequenced pulsations, weaving a minimalist walking which skips as a wandering one-legged man. The walking accelerates gradually the pace through many sound graffiti which get twist in the nothingness of the hollow winds. We are right in the heart of retro Berlin School here. So much that this approach makes me think enormously of Robert Schroeder in his time of Paradise, especially with these murmurs which join the parade some 3 minutes farther. This movement hits the wall around the 15th minute point, restructuring so this rhythm, always very relaxing, in a more fluid phase where the sequences, certain with tones of voice, skip and sparkle in the soft oscillations of a crawling bass line. A cloud of prism encloses this movement of which the velocity grows ceaselessly and where other sequenced keys add a weight of romance, whilst that "Out of the System" reached its 4th phase with sequences which swirl under some very good synth solos. This is what I call a great old Berlin School track! It's been a while since I heard of PJ Skyman. Yet, the likeable French musician-synthesist had not abandoned his project to return with a 3rd album. And it's about 8 years farther than he makes a comeback with a factory pressed CD which is entitled “Public Glass World Extends Bordel”, a Java code language which means that our world is built upon disorderly rules. The album presents an EM which draws its influences between the cosmic fragrances of Jean Michel Jarre, although "The end is nighT" does very Schulze of the Blackdance years with a touch of very contemporary ambiences, and of the Orbital on the verge to caress the jerky beats of Underworld. Composed essentially between 2007, either after the album Walkers, simply we are (there is a certain correlation to make between both albums), and 2010 “Public Glass World Extends Bordel” saw firstly the light of day in 2010 in downloadable format. 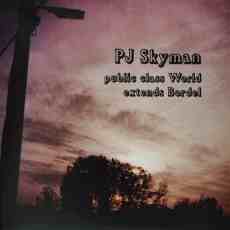 Pierre-Jean Asmus, the man behind PJ Skyman, undertook then a real fund raising on the Internet in order to finance his project so that his 3rd album could be made in real manufactured CD. One has to believe that the music is solid so that people believe in it ... and it is actually good. To say the least very creative! And that begins in a attractive way with "Extra-easy Listening". After an ambiospherical intro, loaded of very vampiric layers of organ and inter spatial waves, an immense shadow of bass banister hypocritically. Its flabby body awakens jingles of cymbals and switches into unsteady pulsations before turning into constant and solid beats, guiding the ambiospherical wanderings of "Extra-easy Listening" towards a strong techno of which the boom-boom/tsitt-tsitt always remains dominated by the cosmic moods. Each track in “Public Glass World Extends Bordel” are linked into an immense sound painting of 80 minutes which are subjugated by elements of cosmic psychedelism. Like the opening of "Zeemoshonawlpeace" which gradually sees its notes of piano going out of its prison of interplanetary tones to run away with jingles. Little by little a kind of Acid House structure of the kind shakes shyly these ambiences before that "Zeemoshonawlpeace" dives back into its immense ambient-cosmic mosaic loaded of interstellar elements which sing and sparkle on a cloud of industrial pulsations. I think it's good....But some people will say that it's kind of very long! That depends on points of view. The idea of PJ Skyman is to make us float, to make glide in space and he reaches his aimed point. "À écouter sans Substance Particulière" hangs on to this ambiospherical etiquette with a music without beats and among which the arid winds and layers were conceived with home-made sound synthesis box; the NE555Synth. Atonal but creative! "Rien ne s'invente, tout s'hérite" shakes a lot these moods with a heavy and very juicy technoïd rhythm, kind of Drum'n'Bass, where run agile and harmonious keyboard chords. This is IDM at its best with a lot of creativity, in particular at the level of the spirals of harmonies. Its finale of deep ambience sounds throws itself into the experimental brooks of "Private String Utopia;" which does very Pierre Henry with its fragments of ambient melodies which are liquefied in a dense floating shroud. We are at the doors of a very experimental ambient music here. The last minutes are stamped by technoïd boom-booms which carry the beat up until the first minutes of "The end is nighT" from which the hysterical rhythm will faint in ether perfumes of Klaus Schulze. That does very Blackdance, especially with a techno finale. "Starfloor Anthology" brings us to another level with a very French electronic sound (kind of Zanov) where an ambient intro, fed by a text on Vocodeur, dives towards a structure which mixes the synth-pop of the 80's to a down-tempo hammered by acidified percussions. The track mixes its phases of atmospheres and rhythm in a universe where Schulze and The Orb would have go along very well together. A pleasant decoration avenue I would say where PJ Skyman has certainly its place! As soon as we hear these dark breezes shadowed by voices and rustles of goats, these noises came from beyond the grave and these electronic distortions which have as equivalence only the blue smoke stemming out from psychotic clouds; the imprint Binar is back. "Delayed Orders" extricates itself from this ambiosonic decoration with pulsations which spit cracklings and which move a cloud of puny sequences of which the jumps in the shadow weave a delicate melodic approach. The chirping of these sequences are melting to some ringings which illuminate a dense cloud of Mellotron fog. The atmospheres are loaded of chloroform and the rhythm is charmingly mesmerizing. Andy Pickford, who is doing a remarkable comeback lately, loosens his chords of electronic guitar while that slowly "Delayed Orders" is untying a structure of a little bit bumpy down-tempo where the vapors of the England School, moderated in an ambient progressive approach a la Pink Floyd, for the keyboard which does very Rick Wright, continue to enclose these always ambient beatings of "Delayed Orders". The Pickford/Nagle duet lies down little by little his electronic painting which will be of used as anchoring to the next 60 minutes of “Mushroom Vimana”; a comeback album after a hiatus of nearly 10 years of those boys who has marked the imagination of more than a fan of the England School. 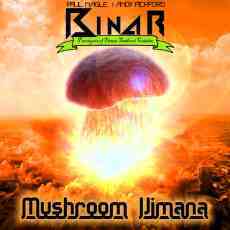 Improvised, and doubtless practiced in the den of their excess, “Mushroom Vimana” was recorded during the performance of Binar at the Awakenings Festival (see here) in July 2015 in front of a crowd of empty chairs in delirious, dixit the Bandcamp site of Andy Pickford. And the least we can say is that the enigmatic duet always manages to harmonize the creative madness of its two creators in a sound mosaic which starts again more or less where Spindragons has left the adventure. In the sense that the rhythms are mainly tempered by dense clouds of atmospheres and in the sense that the movements of sequences bicker between rhythmic or melodic avenues. In fact, Andy Pickford and Paul Nagle have quieted down. But the music, their madness his always there. They are always very imaginative, but they traded their suits of electronic rockers in order to lead us towards more ethereal banks. On a very soft rhythm, a rhythm skipping on a meshing of jumping pulsations and of sober percussions, "Prangfoo Vindaloo" offers us a superb serenade strummed in an electronic envelope which spits its poisons of the discord around the 7th minute with sibylline harmonies. Harmonies which swirl loops on a structure became less clement of the sweetness of the electronic piano by restructuring its approach with sequences which jump up randomly in a pouch which will always remain prisoner of its electronic atmospheres. Waves of wandering harmonies fill up one finale which drives us towards "Psychotic Samosa". That will have take 30 minutes of ambiences and of charms of the ambient beats before that Binar decides to feed ears, always on the alert, of this armada of rhythms which will always remain so difficult to seize than to describe. The sequences are lively and are sculpted in the impatience with filaments which swirl in these delicious Binar moods. The laconic pulsations invite their stoical beatings in this swirling dance, amplifying a static rhythm which adorns itself of the tinglings of the cymbals. A cloud of Mellotron wraps this unreal dance that some jingles fatten with an object of hearing seduction. The pulsations become heavier, livelier. And the beat takes off! It's heavy and infectious. Blue clouds are swirling all around, as well as these faded voices and these percussions of which the echoes resound constantly, while that Andy Pickford is tricking our ears with solos of a guitar which are shaped in the secrets of his synth. This is some great e-rock filled with the pastiches of Krautrock. "Psychotic Samosa" runs away towards the delicious "Electribe Sag" and its structure which limps such as a wounded horse and which scampers awkwardly in the ornamentation of disaster of which surrounds the universe of Binar and where the wall here ooze of lamentations. The trot accelerates and we guess a series of sequenced keys falling to pieces. They get loose in order to crumble a structure which nests in a mysticism amplified by a finale loaded of clashing tones. These deformed sonic clouds are watering the introduction of "Floatylite" and its onset of rhythm which harmonizes its jumping crystal clear sequences with a thick cloud of quirky electronic tones. An incredible troop of sequences runs away, like a herd of wild horses, and skip in the electronic plains where a keyboard a la Rick Wright establishes a climate of serenity, the other hillside of "Floatylite". Short but lively and heavy, "Afterfloater" pulses ardently into an electronic decoration fed of strata mummified by orchestrations and by an impressive wall of very symbolic Binar style electronic fog which have undoubtedly set the fire to this troop of empty chairs and which stuffed an EM always imagined in the complex visionary corridors of Paul Nagle and Andy Pickford. "Vimanarama" is a bonus track which was also recorded during an improvisation session of the duet Pickford/Nagle. The imprint is the same that the one in this Awakenings concert with a rhythm which jumps in the resonances waves of the symmetric pulsations to which are added some slamming percussions. The shadows of very ghostly synth solos around while Andy Pickford's false guitar floods our ears of very ethereal solos. The rhythm becomes more lively and more incisive but always stays without secondary road. A vision which could doubtless annoy the non-initiated to the Binar magic, who does a shy comeback I have to say but a retour which aims my expectations because Binar never made things like others and it's the nature of its charms. And this “Mushroom Vimana” is full of those! I just wish that we won't have to wait another 10 years before having some other goodies from these wild and creative men. There is Perge! 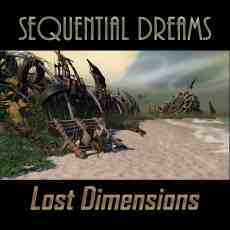 There is now this international consortium of emergent musicians, Sequential Dreams. Backed up with the collaboration of Altocirrus, Johan Tronestam, Synthesist and David Bruce Davis; Kuutana draws his inspiration and creates his music in the soundscapes of Tangerine Dream, period Green Desert to Exit while giving a wink to the fiery electronic rock of the Seattle years. Offered in a downloadable format, the artwork from Andreas Schwietzke is simply sublime, “Lost Dimensions” is an electronic ode with a futuristic flavor where a traveler of time escapes an imminent danger on Earth by travelling 1 000 years later in the future. But it's not this story which catches our attention on this album. It's the music! I rarely heard a music which sounds so near Tangerine Dream as this 6th opus of Sequential Dreams. Ron Charron has peeled on the tones of the Dream through its ages, reproducing successfully those metallic riffs, the solos of Edgar, the sequences of Franke and the percussions of Camaa in a mosaic of rhythms and atmospheres which denies not at all its sources of inspiration. A flute with the soft perfumes of mysticism from Legend floats in the opening of "Journey to the Heart of Time". It's very ethereal, even if a small movement of ambient rhythm shakes its bones which skip stealthily. The percussions which fall share the decoration with some snoring layers of which the vampiric undulations are waving slowly. There is a thin line of sequences which bustles nervously in the background, but the onset of this long sonic river remains veiled of mystery. The layers of synth throw an Arabian aura. They are at the heart of the first transitory movement of "Journey to the Heart of Time" which goes to an up-tempo structured on nervous electronic percussions. It's a lively and jerky rhythm with sequences which oscillate heavily and percussions of which the echoes of the rollings weave a structure which has the perfumes of Green Desert. The guitar of Kuutana does very Edgar Froese with ethereal and harmonious solos which roll in loops while the riffs of keyboard incites our souvenirs to remember the Exit years. There are Arabian perfumes which roam everywhere, sounding out of place with this futuristic decoration. But we don't care. Only the music matters! And it's good. If "Journey to the Heart of Time" turns out to be a difficult fight to assimilate all these charms which pass in transit around a long structure divided between slightly modified phases of rhythm, between up-tempos and a down-tempo and between some more or less brief ambient passages, "Across Dimensions" hits right in the target. Composed with Altocirrus its opening is appealing with this stream of sequences which oscillates in an ambient ascending movement. Riffs of keyboard and breezes of voice adorn this presentation where the movement of sequences loosens little by little a slightly stroboscopic thin line. The approach always does very TD, the purpose resolutely looked for by Sequential Dreams, and the rhythm is getting melt in a more fluid structure with a nice movement of sequences that Kuutana merges in sound fineries just like in the so famous Virgin years. Ron Charron is doing quite a work here by peeling the sounds and atmospheres of the Dream to recreate them in a perfect illusion. Everything is in the tone! The rhythm takes the shape of the sequences and percussions storms from Franke while the guitar and the keyboard layers inhale the reveries of Froese and the romanticism of Schmoelling. The 2nd part is simply exhilarating with sequences cut in a glass factory and of which the harmonious fragility resists to the strikings of percussions. Here we dive into the Stratosfear universe (by moments we are there) with riffs of acoustic guitar and these atmospheres borrowed from the mysteries of 3 A.M. at the Border of the Marsh. But Kuutana stays in the originality by concocting rhythms and ambiences which are inspired by this period, in particular a superb solo of synth, while having a very personalized cachet. "One Thousand Years", written with Johan Tronestam, as well as "Brave New World" are nervous e-rock inspired by the Seattle years and the TDI one's, in particular Mars Polaris for "Brave New World" with rhythms fed by a percussions game which is very near the style of Iris Camaa. Although centered on the same approach of electronic rock, "Distant Signals" distances itself by its heavy and juicy sequences which oscillate peacefully in resonant riffs, breezes of flutes decorated with ethereal voices and by a psychedelic backgrounds being inspired by the good years of Pink Floyd, as of White Eagle. "Descendants" adorns itself with these metallic elements with a long motionless structure where sequences and percussions weave a nervous rhythm that a synth caresses by some nice enveloping layers. A mixture of Green Desert and White Eagle! A mixture which makes of “Lost Dimensions” an inescapable to the fans of Tangerine Dream, all periods aimed. There is Perge and now Sequential Dreams! Weird murmurs (African spectres?) which spin in a sound envelope full of quirky tones (rustles of leaves?) are swirling as being propelled by a sling shot. Reverberating waves infiltrate between the jets which revolve in loops here, creating an apocalyptic atmosphere where the rustles and the sectarian warbles dip us literally into a hostile universe. These 90 seconds which fill the introduction of "The Tree" are the witnesses of the sound aestheticism which surrounds “Transposing”; the very first album of The Tower Tree. 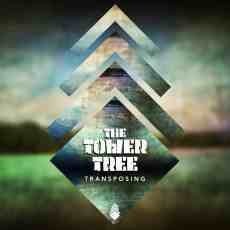 And who is The Tower Tree? It is the union of two craftsmen of the Belgian EM scene; Didier Dewachtere (BySenses) and Johan de Paepe(Owann) who have teamed up within the framework of the last B-Wave Festival which took place in Limburg, Belgium, in last November. In solo, each artist had rather seduced the spheres of EM with fairly different albums where the influences of Klaus Schulze, BySenses for Frigments-Fragments, were stigmatized in an approach of psybient and down-tempo, and those of a Tangerine Dream swaying between the 70's and the 80's, Owann for Particles, were particularly soaked with a very oniric approach. Furthermore the tracks "Destination Unknown", although slightly different here, and "One Day we will Walk Together", are respectively taken from albums Frigments-Fragments and Particles. And considering the beauty of these albums, the expectations were rather high for these two friends who were very shy at the idea of participating to this festival. And in the end, “Transposing” turns out to be a strong opus where the minimalist structures are perfect gifts to a sonic enchantment which goes beyond our waits. The delicacy of the sequences which skip in the carbonizing residues of these 90 seconds is quickly harpooned by a line of sneaky bass which floats as a shadow of rhythm in order to stimulate percussions of which the sharp rollings are structuring an up-tempo beat gesticulating with brief and dynamic jolts. "The Tree" shakes and spits a fluid rhythm in spite of the jerks and the incisive orchestral movements. Synth layers filled of poetry infiltrate this lively and hard tempo which remains all the same musically attractive. A structure of rhythm which subsides at the dawn of 3 minutes, just to bounce of more beautiful with organic tones which sparkle in the sharpness of the pulsations and the percussions of which the flow sounds weakly touches now like the one of a machine-gun spitting balls of hip-hop and pieces of metallic elytrons. A second ambient passage, always so brief, brings this backbone of rhythm in a passage filled of psy-trance elements before it pops out again with an even more violence captured in synthesized perfumes which smell so like in the musical patterns of a certain Tangerine Dream. "The Tree" kicks off an album structured on a similar pattern where the beat is attacked by deep moods of an unreal universe of tones and sounds. An universe which will seduce you even more in the subsequent listening so much the wealth of its sound fauna is embroidered in originality and boldness. Like the signature of BySenses! After this spasmodic rhythm, the superb "Transposing Mind" transports us in the contemporary territories of Klaus Schulze. It's 18 minutes of pure exploratory happiness where the amplitude of tones is such as we have the feeling to discover new horizons to each new listening. Following a rather cerebral overture where the brain tries to discern a flora cultivated of noises and sound-effects which sparkle in the sound charms of wet pulsations, other more keen and more steady pulsations pierce a cloud of wandering voices filled by a bituminous fog. This first structure of minimalist rhythm is magnetizing and its hypnotic course is decorated with fineries which will seduce the most demanding swallowers of sounds in you. First of all, the reflection of the rhythm! Its shadow spits a kind genre of tribal gurgling which amplifies its relatively passive pace. It's lively! Enough to stimulate a kind of esoteric trance where the cosmos encloses this desire to burst. I can't help it, but I have this vague impression here to hear the rhythmic ancestor of Chronology Part 8, from Jarre, to say at least its primary skeleton. Chords are dragging adrift, weaving solos weakling of whom the melancholic approach is melting to these synth layers filled of faded murmurs and of cosmic effects. This structure is so intrusive that we notice hardly the crescendo that militarizes it at the end of 10 minutes. Slow riffs gallops now on an ambient passage, with a rather industrial perfume in the tones, where the psybient of BySenses bickers with the lyric of Owann. The synth layers, and these choruses that they spit, throw here a vampiric atmosphere which is similar to Schulze's post In Blue. Or still to these nightmarish waves of Remy. And this crescendo! It overflows its axis with organic tones which amplify an approach either tribal or esoteric, like a Roach taken in a gearing of sequences of the Jerome Froese years in Tangerine Dream. This is very good. And "The Tower" is not outdone! Sequences tinkle in fogs of voices and in layers to the colors of aridity. The lively and undulatory movement sees getting grafted by ectoplasmic murmurs, of shadows of bass and of silky orchestrations. And when I search my memory, my library of sounds and music, I hear here the premise of Melt by Leftfield. After a short ambiospherical passage, the orchestral synth layers propel again the rhythmic structure of "The Tower" in a spasmodic approach, on the other hand lighter than that of "The Tree", where the sequences answer their echoes. Forging than a kind of electronic hymn closer to the lands of Electronica with an effect of stop'n'go where the heavy layers of synth eventually wrap "The Tower" in an ambient phase. There is little to add about "Destination Unknown" and "One Day we will Walk Together" except that these two tracks show that in duet The Tower Tree transcends their respective styles. And that “Transposing” is the outcome of two musicians who decided to leave their imprints in this wonderful universe that is EM. Superbly delicious and highly musical, it exceeds my expectations from the beginning to the end!